Oh boy! This started a mess. “What’s wrong?” she asked. “Are you sick? Did someone die? Greg tell me.” You know… it’s really hard to NOT break the 9th Commandment. I didn’t want to lie. But I wanted her to come home quickly to see her surprise. She hadn’t seen Spencer since December. Well… to make a long story short, Leslie was called to Burbank to play at various schools. By the time she got to come home… it was nearly time to take Spencer back to the airport the next morning. Folk, any ideas how to surprise your wife next time? Happy Mother’s Day to you, Leslie! And to my mom, Addie Garman, as well. ENCOURAGEMENT: On the third day a wedding took place at Cana in Galilee. Jesus’ mother was there, and Jesus and His disciples had also been invited to the wedding. When the wine was gone, Jesus’ mother said to him, “They have no more wine.” “Woman, why do you involve Me?” Jesus replied. “My hour has not yet come.” His mother said to the servants, “Do whatever He tells you.” (John 2:1-5) What an incredible story! Jesus’ first recorded miracle… sort of. I kind of think it was miraculous in the way He called Nathaniel… after all, Nathaniel was quite stunned that Jesus knew so many details about him. But the bottom line is that Mary, Jesus’ mother, was well aware… for perhaps 30 years, that her Son was incredibly special. She had witnessed the way His disciples had already begun to follow Him. She knew He was gifted. She knew that her Son was conceived by the Holy Spirit. She was the only one walking the land who knew that she had never been with a man before Jesus’ birth. Jesus was different. And she knew it. I don’t know if this miracle occurred on Tuesday or if it happened on the third day of the wedding celebration. It really matters not. But, there was a need and a mom who was there knew just where to find the answer. I love to hear stories of moms who go to the right source for answers. I’ve witnessed that time and time again. While on the mission field, in the Amazon jungle of Peru, many times we had no communication with the outside world… AND THERE WAS A NEED. Sometimes it was a snake bite victim who was lying on their deathbed. Other times it was a girl burned in the fire and half dead. Or a nose bleeding man coughing up blood and going unconscious. (How many times was there the fear factor that if a patient died in the clinic, the people in the jungle would hold the “witchdoctor, or overseer, or doctor” responsible! And their lives were on the line.) A young mother not able to deliver the afterbirth… or her own son (Rusty) who was near death with malaria… another son (Tim) who accidently drank kerosene and went unconscious before he had even learned to walk. My mom, just like Mary, also knew just where to go. To the corner of her bed… on her knees, she too, went to Jesus. Not once… or twice… but time and time again. When’s the last time you went to Jesus? DISTRICT MATTERS: Blessings on you as you honor the mothers in our churches this Sunday! Happy Mother’s Day to all of our moms! Spanish Pastors’ Day: Thank you, Pastor Josué Tigüilá, for bringing us together in the Conference Room last Saturday. We had nearly 30 people present and Pastor Ismael Joaquín did an outstanding job in giving us the devotional. Thank you, Howard Wooton for coming in on this Saturday to speak on Insurance issues. You are a blessing to the district and to me! Santa Monica Spanish: What a joy it was to worship this past Sunday with our brothers and sisters in Santa Monica where there is life and enthusiasm. God’s presence was certainly with us as we joined together to officially organize the Spanish Church. Pastor Edgar & Rosario Monterroza, along with their team of leaders are doing an exceptional job in ministry. We thank the Lord for the growth taking place. Northridge Korean: Following the wonderful service in Santa Monica, I hopped back on the freeway to meet up with Leslie at Northridge where we joined the Korean congregation in their 1 Year Anniversary of ministry. Thank you, Pastor Jack & Mari Kim, for the great ministry you are leading among the people near Northridge. It was a blessing to see so many of our other Korean Pastors from across the district. District Building: Well… as you can imagine… changes are always taking place, here… there… everywhere. And right here underneath us, the very building the district owns, we are having to make huge capital and tenant improvements as we gather new tenants. I thank the Lord for Shay Pierson, and her diligent work overseeing many of these projects. PASTOR’S REPORTS: Pastors… All reports should now have been completed. Thank you! 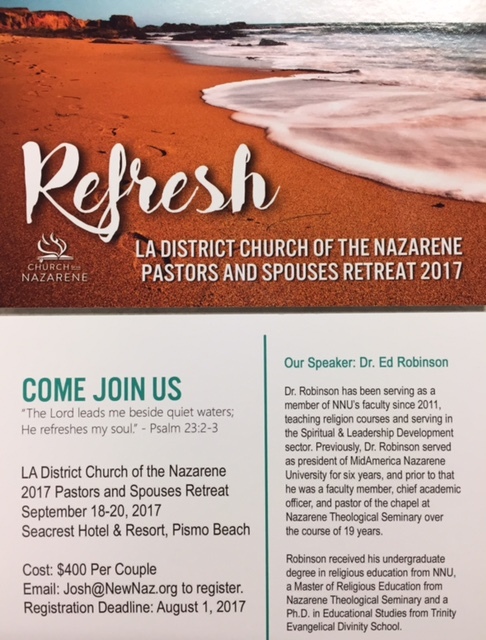 September 18-20: Pastors’ and Spouse Retreat – Seacrest Hotel & Resort, Pismo Beach. 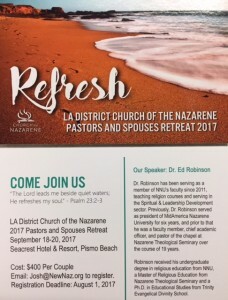 Register with Josh Johnson at Josh@NewNaz.org Registration Deadline is August 1st. I’m so grateful for you and your ministry. May the Lord bless you as you honor mothers across the district this Sunday! It’s a great day to be active in ministry. I love you and I hope to see you soon. This entry was posted in Uncategorized on May 12, 2017 by Shay. Yesterday was our National Day of Prayer, and I trust that you were able to spend a few more moments in prayer lifting up our Nation before the Lord. We need to pray for our city, state, and federal leaders as well as lifting up those who serve our country in the various capacities they work. Military… Embassies… Representatives… and much, much more. Do you pray for our President and his cabinet? Do you pray for your church to be the light we need to be in our country we live in today? May the Lord bless us with the wisdom He can only bring! We may NOT like every detail to all situations in life. I’ve been journeying my way through the Book of Job, once again. His wife even told him to “curse God and die.” I’m certain the Apostle Paul was NOT that excited to be lying in wet, damp, dark, cold jail cells… chained to a post… but He still managed to give thanks to God. And right here the writer in the Psalms reminds us that we have a story. You have a story. I have a story. We all have a story to tell. Our stories must not be kept silent. He says that if we are redeemed we NEED to “tell our story.” People have got to hear it. People from all sides of the globe need to tell their story. Those in the east…and those in the west… tell your story. If you live in the north or the south… tell your story. What’s your story today? Has the Lord redeemed you? It is time to share your story of God’s sustaining grace. You know… a picture is worth a thousand words. While attending the Casa Robles Prayer Meeting yesterday, I stopped to take a photo of this sign out front. Notice the story it tells… Can you spot the irony? DISTRICT MATTERS: These recent days as I’ve traveled the district, I have become more and more amazed at the beauty of God’s creative work. Check out some of the landscapes across the district. Nipomo: It took me a while, but I was finally able to drive up and be part of the New Beginnings Church of the Nazarene in Nipomo where Pastor Mark and Becky Valadez are doing an excellent job in ministry along with their team of leaders. I was reminded of the great challenges that many of you make each and every Sunday, having to set up… and tear down… week after week after week. May Jesus bless those of you who do this all the time! What a blessing it was to be with you this past weekend! Pismo Beach: While visiting and meeting with the Church Board at the New Life Community Church in Pismo Beach, I spent a few moments in prayer beforehand at the Prayer Walk they created. My word! This is an absolute must see if you are ever in the Pismo Beach area. Great job, church, for your work on the project! Temple City Immanuel: Just this week I was able to meet with the leadership team in Temple City as they begin their journey in pastoral transition. What a wonderful job Pastor Charles Lin and his team have been doing there for all of these years! I look forward to seeing how the Lord will use this church as a lighthouse of His love in TC. These are great days to be alive and to be active in ministry. I love you and I look forward to seeing you up ahead. May Jesus bless you! See you soon. This entry was posted in Uncategorized on May 5, 2017 by Shay.